WESLEY BRAD HUNTSMAN was born on February 26, 1962 in Winner, SD to Larry Wesley and Mary Lue (Funk) Huntsman. By the time he was five, he had lived in South Dakota, Wyoming, on the Island of Guam, Colorado, and Nebraska. The family travels also included visits to Hawaii, Hong Kong, Japan and the Philippines. The rest of his childhood was spent in Fort Collins, CO, Alliance, NE, Colton, SD and Jasper, MN where in Junior High and High School he played and lettered in basketball, football, baseball and track. Wes was a member of the National Honor Society at Jasper High School. In 1979, he was selected for the All Conference Defensive Team – Star Conference Football; and in 1980 was awarded All Conference Honors in Baseball-Tri County Conference. Wes graduated in 1980 from Jasper High School. He attended South Dakota State University, enrolled in ROTC and baseball, earning his bachelor’s degree in 1989. Wes also played for amateur baseball in Jasper and Dell Rapids’ Blue Ribbon as a pitcher and first baseman. He was a member of the Blue Ribbon Club when they were runner up in the 1989 South Dakota Amateur Championship. His baseball ended when he joined the United State Air Force that year, and changed to Air Force Softball. Wes loved playing and refused to say it was getting harder for him and his brother, Al to beat his children and Al’s son, Chris in family football games at night on the ELC church lawn beside their home in Jasper. Air Force Base assignments: Aviano, Italy where he was selected in 1992 as Senior Airman of the Year, moved to Hill, UT where he was Project Manager 1993-1996, 1996-2000 served at Ramstein, Germany as Lead Civil Engineer Contingency Instructor, and 2001-2003 Construction Project Mgr./Planner at Dyess, TX. Wes served in Osan, South Korea as Engineer Supervisor for the year 2004, returned to Peterson, CO as Engineering Technical Services Mgr. from 2005 – 11/2006 at which time he was discharged by the Air Force for health reasons. He was then employed by Tetra Tech, Inc. as Engineer IV, and in May 2009 moved to a federal job at Schriever, then transferred to Cheyenne Mountain where he was employed at the time of his death. In 1989, Wes married Jenny Schneider in Jasper and had three children. Aaryn was born in Pipestone, MN. While serving in Aviano, Italy, Matthew joined the family; and while serving in Hill, UT, Jessa was the first daughter for the Huntsman family. In April, 2014, Wes married Katherine Hamilton and became a father to her two grown sons, Connor and Ian. Wes loved to play cribbage and board games with family and friends, he was not a graceful loser. He enjoyed all sports, especially the Vikings and Twins since he lived in Alliance, NE and later added the Wild and Lynx. He was always up for telling his jokes and stories. His memory was like his father’s, he never forgot. So, do not argue with him, because he was correct. 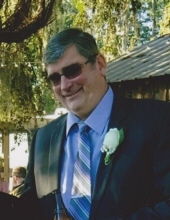 He enjoyed his family and lived for his children and their sports and watching his favorite movies over and over. Wes is remembered by his wife, Katie and her sons, Connor and Ian of Colorado Springs, CO; his three children, Aaryn of Denver, CO, Matthew (Jessica) of Lakeland, GA, Moody AFB, and Jessa (Nick Beaudette) of Sioux Falls, SD; their mother, Jenny O’Neill of Denver; one brother, Alan (Grace) of Taunton, MA; nephew, Christopher (Alissa) of Chestnut Hill, MA; Chris’ mother, Carole Ann of Chestnut; and his mother, Mary Lue of Jasper, MN; and many in-laws and close friends. He is preceded in death by his father, Larry; grandparents; and other relatives. To send flowers or a remembrance gift to the family of Wesley Huntsman, please visit our Tribute Store. "Email Address" would like to share the life celebration of Wesley Huntsman. Click on the "link" to go to share a favorite memory or leave a condolence message for the family.